Sometimes I really just want a good two-hand-er, ten-napkin kind of hamburger. And almost every other day of the week, I would love a good veggie burger (that is not a boring soy-paste patty). I’m always on the look out for a good burger… but with all the restaurants in Houston, where do I try first? I asked that BigKidSmallCity community, and this is what YOU told me. Thank you! If you have a burger place to recommend, tell us! Lankford Grocery (Montrose) – Started as a grocery store, this restaurant introduce the burger in the 1970s (and has not looked back!). 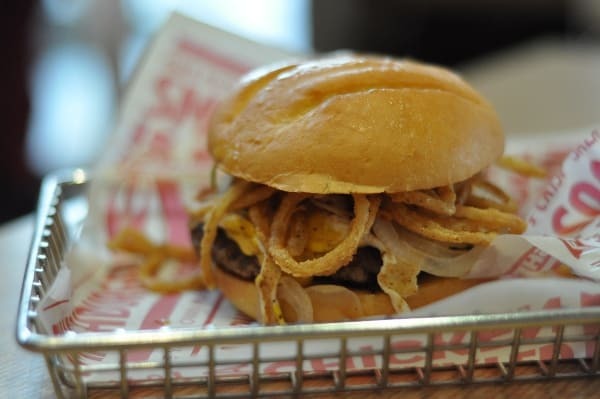 Liberty Kitchen (Heights) – Try the Thrashed at Maverick’s Burger! Graffiti’s (Heights) – Makes a great burger! The Counter (Heights & The Woodlands) – Custom made burgers. M&M Grill (Almeda & Old Spanish Trail) – Mexican and Mediterranean Grill! Try the “Loaded Double”! Elevation Burger (Kirby) -Organic, Grass-Fed, Free Range Beef Burgers and Fresh Fries. Hub Cap Grill (Downtown, Heights, Kemah) – Fresh, never frozen. Buff Burger (Memorial) – Good burgers, thin fries and great shakes. Southwell’s Hamburger Grill (Multiple Locations) – Good food and they “treat customers like family”! Smashburgers (Multiple Locations) – Good fast burgers! Willies Grill & Icehouse (Multiple Locations) – Good burgers AND a sandbox for the kids! Burger Barn (Multiple Locations) – Burgers and wings! Jerry Built (The Woodlands & Bellaire) – Good food AND a giant chalkboard wall. Zachary’s Cajun Cafe (Kingwood) – Food is made in house daily from fresh ingredients. Nothing from a mix, a can or jar. The Shack (Cypress) – Great burgers and very kid friendly… with a giant yard for playing! Tookie’s (Seabrook) – Great food and the friendly hometown atmosphere. Ron’s Hamburgers & Chili (Tomball) – Big chili burger, large portions and good fries. Rudyards (Montrose) – Delicious black bean burger. Hobbit Cafe (Montrose) – Good black bean burger. Beavers (Heights) – Amazing nut burger! Barnaby’s (Multiple Locations) – Several choices of veggie burgers… that are great! Falafel Burger, Boca and Black Bean! Ruggles Green (Mulitple Locations) – Try the Veggie Nut Burger! Field of Greens (River Oaks) – Great veggie burgers! Where in Houston? Tanks at 255 and Independence Freeway!